Introduction Neurofibromatosis (NF) is a relatively common disorder occurring approximately in 1/3000 births (1, 2, 3). Bolande (4), first introduced the term of neurocristopathy to point out the common neural crest origin of all involved tissues in NF. Although the involvement of tissues not derived from neural crest was reported (1, 5), the hypothesis that NF is a disorder of neural crest origin could be well-founded yet because the alterated neural crest derivates could be able to product disorders in not derived from neural crest tissues (1, 3). The melanocytes are derivates of neural crest too. They produce one of the most costant features in NF, the cafè au lait spots. Association between cutaneous melanoma and NF is reported in literature. However, although melanocytes clearly are involved in NF, the association of both the disorders is not demonstrated and the correct incidence of cutaneous melanoma in NF is unknown. We report one case of a patient affected by cutaneous melanoma and NF. MELANOMA CUTANEO ASSOCIATO A NEUROFIBROMATOSI TIPO 1: RARA ASSOCIAZIONE? RESOCONTO DI UN CASO. REVISIONE DELLA LETTERATURA La Neurofibromatosi (NF) è una patologia relativamente comune caratterizzata da macchie cutanee pigmentate, neurofibromatosi multipla e noduli di Lisch (amartomi pigmentati dell’iride). Si ritiene che questa patologia sia una neurocrestopatia. Anche i melanociti derivano dalla cresta neurale. Sono stati descritti finora in letteratura ventisei pazienti con neurofibromatosi associata a melanoma cutaneo maligno, ma i dati riguardo l’associazione delle due patologie non sono univoci. Riportiamo un ulteriore caso da noi osservato di melanoma cutaneo maligno in un paziente affetto da NF, e viene considerata la possibilità di una maggiore incidenza della associazione delle due patologie, attualmente sottostimata per mancata diagnosi di NF. Parole chiave: Melanoma maligno, malattia di Von Recklinghausen, neurofibromatosi, cresta neurale. Abstract Neurofibromatosis (NF) is a relatively common disorder characterized by cutaneous pigmented maculas, multiple neurofibromas and Lisch nodules (pigmented iris hamartomas). This disorder is retained being a neurocristopathy. Melanocytes are neural crest derivates too. Twenty-six patients with neurofibromatosis associated to cutaneous malignant melanoma have been reported till now, but data on association between these two pathologies are lacking. One more case of malignant cutaneous melanoma in a patient with neurofibromatosis is reported and the hypothesis of a more frequent association than usually believed of these two pathologies is discussed. Key words: Cutaneous melanoma, Von Recklinghausen’s disease, neurofibromatosis, neural crest. Fig. 1: Dermal and epidermal infiltration by a cutaneos nodular melanoma (EE-4x). Fig. 2: Trunk and abdomen neurofibromatosis. Neurofibromatosis is an autosomal dominant trait with variable expressivity. Riccardi distinguished four different forms of NF at least (3). The most common form (90% of cases) is that so-called classic or peripheral or von Recklinghausen’s disease or neurofibromatosis type 1 (NF1) (5, 6). Only one half of all cases are inherited, while the others result of new mutation (2, 7). The most clear and virtually always founded features in NF1 are cafè-au-lait spots, neurofibromas and Lisch nodules. Cafè-au-lait spots, so-called for their colour, are skin pigmented lesions variable in dimensions (1-2 cm to 15 cm) usually present at birth. They are distributed at random on the whole body increasing in number and size during the first decade and, in women, they become darker in pregnancy (3). Generally neurofibromas are cutaneous but they can involve the deep nerves too. Most of them appear during or after puberty. They can be nodular and distinct (such as cutaneous ones) or plexiform type (4, 8). Lisch nodules, or pigmented iris hamartomas, are prominent nodules of the iris surface present in most patients since childhood; at the age of 60 Lisch nodules are present in almost 100% of patients (3, 9). It is possible, as some authors emphasized, that so discordant results could be derived by biased samplings. Silverman (20) proposed that the lacked recovery of such association could be due to the death of the patients with NF1 before melanoma occurring: the middle age of other malignancy onset in patients with NF1 is lower than the melanoma onset of the patients with NF1. It’s possible moreover, in case of association between NF1 and cutaneous melanoma, that it could be not emerged for an understimation of the patients with NF1. NF1 in fact presents an extremely variable expressivity and it’s possible that scantily simptomatic forms are not recognized. Furthermore, even NF1 types with clear clinical signs, could be not recognized from physicians. Our patient, although he presented evident features of NF1, did not had previous diagnosis of NF1. Furthermore the stigmate of the disease could be also evident late: five of 110 patients (4,5%) reported by Brasfield and Das Gupta, developed the NF1 manifestations after the age of 36. Moreover the disease can at first be disclosed only through cafè-au-lait spots, or Lisch nodules which are practically pathognomonic of NF1 (21). In the Johnson (11) study concerning the hystological differentiation of cafè-au-lait spots between patients with and without NF1 (8 patients with NF1 and 4 without NF1) one of these patients was recognized to have NF1 only for hystological features of his cafè-au-lait spots; this patient developed the stigmate of NF1 some years after the study. In short, it’s possible that patients with NF1 can be dead for melanoma before NF1 becoming evident or can be recognized. Conclusion NF1 involves cells of neural crest origin from which peripheral neural cells derive, glial cells, Schwann cells, neuroendocrine cells and melanocytes (6). Although malignant tumours were reported significantly more often in NF1 patients than was expected in the general population (22), association between neurofibromatosis and melanoma, which could be frequent, is rarely reported. Our further case does not confirm neither denies the existence of the association between NF1 and cutaneous melanoma. We hope that our report can promote new studies about this association supporting the hypothesis that patients affected by cutaneous malignant melanoma or other melanocytic malignancy could have NF1. 3) Riccardi V.M. : Von recklinghausen neurofibromatosis. N Engl J Med, 305(27):1617-27, Dec 31, 1981. 4) Bolande R.P. : Neurofibromatosis–the quintessential neurocristopathy: patogenetic concepts and relationships. Adv Neurol, 29:67-75, 1981. 5) Duve S., Rakoski J.: Cutaneous melanoma in a patient with neurofibromatosis: a case report and review of the literature. Br J Dermatol, 131(2):290-4, Aug 1994. 6) Gallino G., Belli F., Tragni G., Massone P.P., Ditto A., Leo E., Cascinelli N.: Association between cutaneous melanoma and neurofibromatosis type 1: analisis of three clinical cases and review of the literature. Tumori, 86(1):70-4, Jan-Feb, 2000. 7) To K.W., Rabinowita S.M., Friedman A.H., Merker C., Cavanaugh C.P. : Neurofibromatosis and neural crest neoplasm: primary acquired melanosis and malignant melanoma of the conjunctiva. Surv Ophthalmol, 33(5):373-379, Mar 1989. 8) Brasfield R.D., Das Gupta T.K. : Von Recklinghausen’s disease: a clinicopathological study. Ann Surg, 175(1):86-104, Jan 1972. 9) Guillot P., Delaunay M.M. : Malignant melanoma and Recklinghausen’s disease. Ann Dermatol Venereol, 117(8):549-50, 1990. 10) Perkinson N.G. : Melanoma arising in a cafè au lait spot of neurofibromatosis. Am J Surg, 931028-20, Jun 1975. 11) Johnson B.L., Charneco D.R. : Cafè au lait spot in neurofibromatosis and in normal individuals. Arch Dermatol, 102(4):442-6, Oct 1970. 12) Conference statement. National Institutes of Health Consensus Development Conference: Neurofibromatosis. Arch Neurol, 45(5):575578, May 1988. 13) Walther M.M., Herring J., Enquist E., Keiser H.R., Linehan W.M. : Von Recklinghausen’s disease and pheocromocytomas. J Urol, 162(5):1582-1586, Nov 1999. 14) Sayed A.K., Bernhardt B., Perez-Atayade A.R., Bannermann R.M. : Malignant schwannoma in siblings with neurofibromatosis. Cancer, 59(4):829-35, Feb 15, 1987. 15) Kaufmann D., Wiandt S., Veser J., Krone W.: Increased melanogenesis in cultured epidermal melanocytes from patients with neurofibromatosis. Hum Genet, 87(2):144-50, Jun 1991. 16) Croxatto J.O., Charles D.E., Malbran E.S. : Neurofibromatosis associated with nevus of Ota and choroidal melanoma. Am J phtahalmol., 94(4):578-80, Oct 1981. 17) Haddad F.S., Jamali A.F., Rebeiz J.J., Fahl M., Haddad G.F.: Primary malignant melanoma of the gasserian ganglion associated with neurofibromatosis. Surg Neurol, 35(4):310-6, Apr 1991. 18) Specht C.S., Smith T.W. : Uveal malignant melanoma and von Recklinghausen’s neurofibromatosis. Cancer, 62(4):812-7, Aug 1988. 19) Baldini M.T., Belli F., Leo E., Bartoli C., Rovati M., Rovati L., Veronesi P.: Von Recklinghausen disease and cutaneous melanoma. A rare association. G Ital Oncol, 8(2):93-6, Apr-Jun 1988. 1) Hope D.G., Mulvihill J.J.: Malignancy in neurofibromatosis. Adv Neurol, 29:33-56, 1981. 20) Silverman J.F., Blahove M., Collins J.L., Norris H.T. : Cutaneous malignant melanoma in a black patient with neurofibromatosis (von Recklinghausen’s disease). Am J Dermatopathol, 10(6):536-40, Dec 1988. 2) Mastrangelo M.J., Goepp C.E., Patel Y.A., Clark W.H. Jr.: Cutaneous melanoma in a patient with neurofibromatosis. Arch Dermatol, (7):864-5, Jul 1979. 21) Menard L., Magnaval G., Donnio A., Ayeboua L., Richer R., Merle H.: Lisch nodules: description of 2 clinical cases and their significance. J Fr Ophtalmol, 24(9):966-70, Nov 2001.
type 1 in a defined Swedish population. Cancer, 79(11):2125-31, Jun 1 1997. Report "Cutaneous melanoma with neurofibromatosis type 1: rare association? 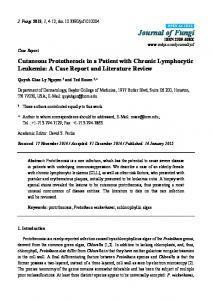 A case report and review of the literature"